Me and judo have some history. Before I started secondary school I went to judo classes held in my primary school hall. I don’t remember much about the classes or why someone decided to run a weekly dojo (school or training hall to study/practice judo) in a small village in Buckinghamshire but I do remember the classes were popular and we had a grading. And I’ve never forgotten how, to my mind, Zoe breached reiho (forms of respect, manners, etiquette), threw me to the tatami (mat), and ended up with a red belt while I had to make do with a few lines of red bias binding sewn onto my yellow belt. But I’m not bitter. Judo showcases a combination of breathtaking throws (tachi-waza), skillful ground fighting techniques (ne-waza) as competitors (judoka) demonstrate their stamina, strength, reflexes, flexibility, and power. Each judoka attempts to land their opponent on their back and hold them on the tatami – scoring points through ippon, waza-ari, yuko. So. On a Friday evening in January I trimmed my nails (hands and feet) and removed my jewellery before heading off to a church hall in Lee to join Northbrook Kyu Shin Kai Judo Club. 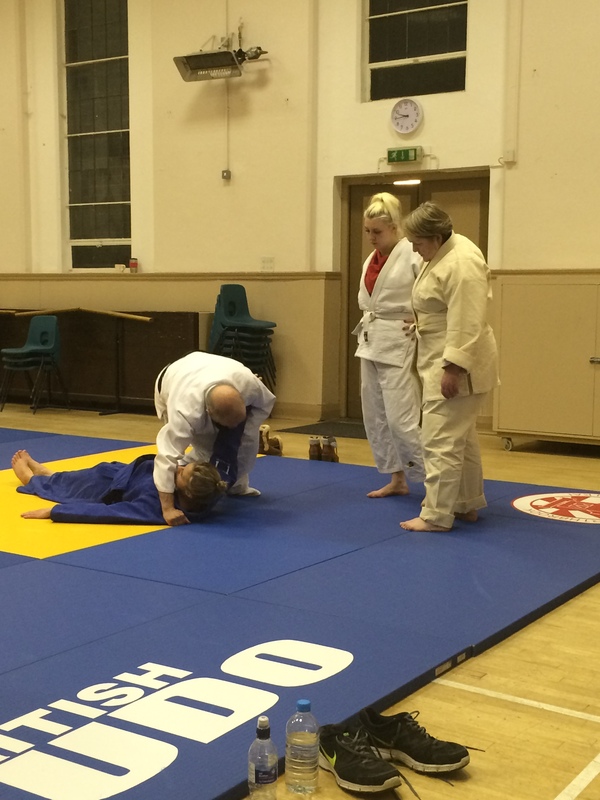 Affiliated to the British Judo Association, the club’s been going for about 20 years and offers a range of training and coaching programmes for children and adults at two venues. 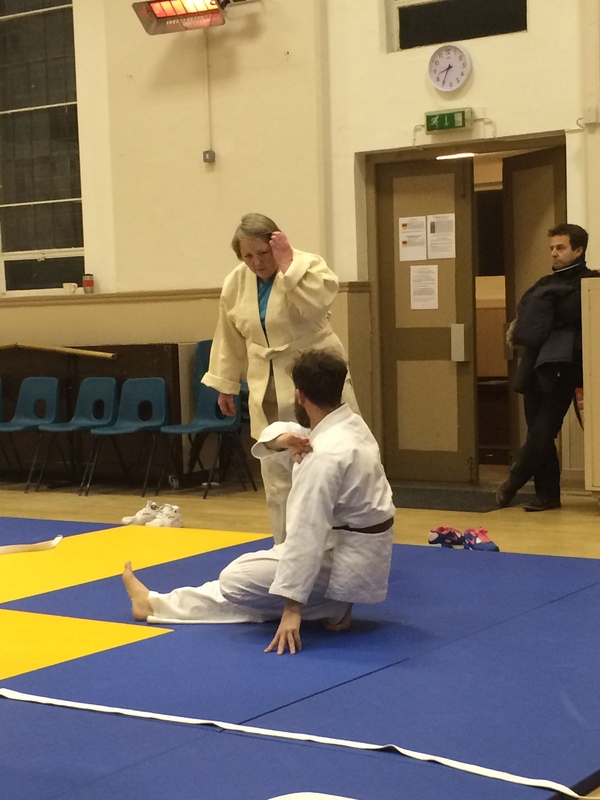 I was nervous as I stepped through the door and the nerves didn’t ease off as I watched the children finish their randori (free practice), and the reality started to hit home that my body would be making forceful and repeated contact with the tatami over the next few hours. 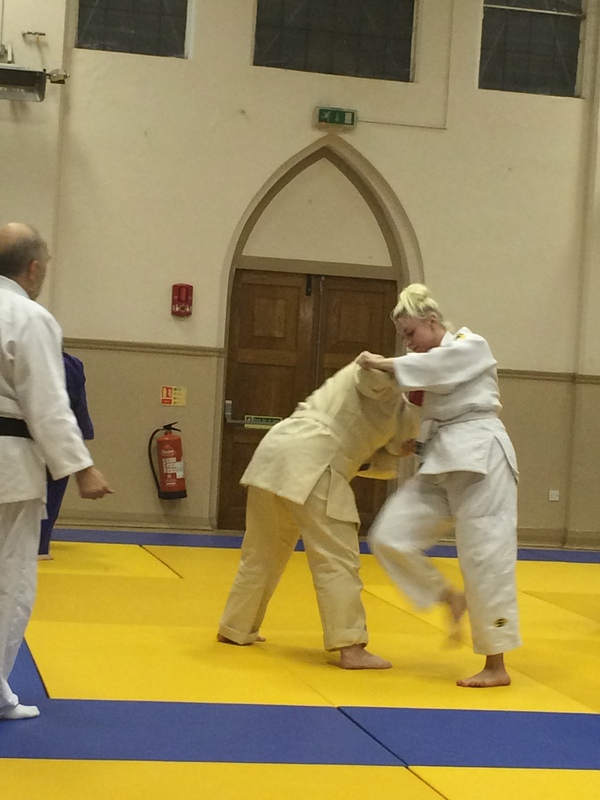 While I was changing into a judogi (judo practice uniform) in the loos, a judoka gave me some useful tips: bow to the sensei (teacher, instructor), don’t stand with your hands on your hips, don’t talk, hajime (start), mate (stop or wait). I wondered whether I could just go home instead. Back in the hall I made a ritsurei (standing bow), left my shoes at the edge of the mat, and took my place in a line facing the sensei. He welcomed the newbies (me and a woman returning to judo after a gap of seven years aka not-so-newbie) and we started the warm-up jogging round the tatami, changing direction and dropping left and right as he called out drills: yoko kaiten ukemi (sideways rolling break fall), zempo kaiten ukemi (forward rolling break fall). I watched the rest of the group rolling, falling and moving to the back of the line to do it all again – faster and harder. I tried to look as though I were studying their technique and working up to a roll and a fall. But the sensei spotted my avoidance tactic and asked coach Aaron to give me some personal training. I practiced falling. I didn’t practice slamming my hand against the tatami. Because I kept forgetting. Even when my head kept jerking back and hitting the tatami. I would not make a good Pavlov’s dog. The not-so-newbie joined us and we started to practice kumikata (gripping methods), holding each other’s eri (collar, lapel) and using our hikite (pulling hand, usually the hand gripping the sleeve) to try to move each other around the tatami. We staggered around, trying to get each other off balance but I suspect we may have looked like two women flailing around after a Big Night Out. Then we practiced rolling over each other to land on our backs. I knelt and crouched close to the tatami, as the not-so-newbie reached over my back I grabbed her arm and pulled her onto her back. We took it in turns to be the puller and the pullee, swapping left and right so we could make the move from either side. I managed to remember to slam my arm out and my hand down. And was surprised at the difference it made. 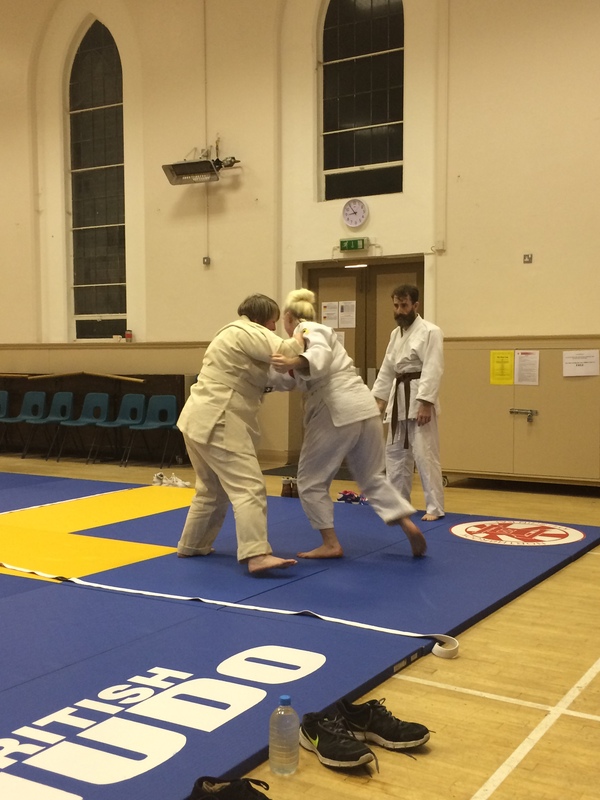 After we’d successfully managed a few rolls, another judoka joined us to show us osaekomi waza (holding techniques). ‘I love teaching this,’ she said, telling me to lie flat on my back. ‘Get in the car, shut the door, put your seatbelt on.’ As she repeated the phrase she sat down close to my body, grabbed my arm, placed her other arm across my body and grabbed the back of the neck of my jacket, and leaned forward. And the phrase made sense. We rejoined the main group for what appeared to be a more combative drill, nagekomi (repetitive throwing practice). I eyed the rest of the group and wondered what excuse I could offer the sensei to get out of it. He paired me with not-so-newbie and, under close supervision, the nage (throw) was broken down into stages: stepping forward, to the side, behind, then pivoting and pulling the opponent to the ground. We practiced a few times without attempting the final stage. Until. The sensei asked me if I wanted to throw and be thrown. 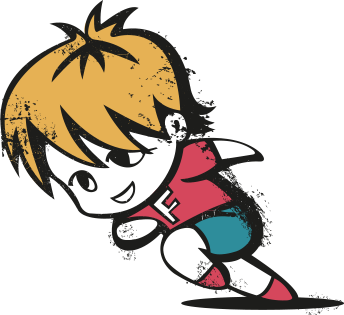 Throwing wasn’t so bad – so long as I remembered to hold onto my opponent as she fell, to help break her fall. Looking at her face I could see the difference it made when I did and didn’t, and tried not to think about what might happen when we switched roles. It was my turn to be thrown. She stepped forward and behind my right leg to unbalance and pivot my body. I slammed down backwards, felt my neck jar, and everything inside me seemed to bounce. I’d forgotten to use my arm and hand to break my fall. My opponent helped me up and checked if I was OK. I knew I had to do it again, quickly. I asked her to keep throwing me and each time it was less awful. 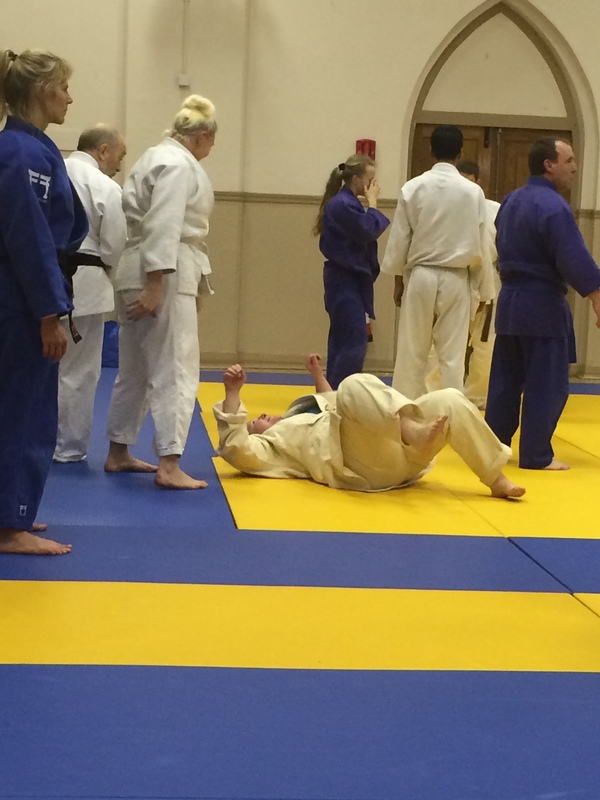 But, although the nerves and the awfulness eased, sadly, I don’t think judo is a sport for me. I was impressed by the strength, power, and agility of the judokas – some of whom were the same age or older than me – but I’ve left it too long and my body won’t now adapt to being slammed around. So, I’ll be adding my not-inconsiderable vocal support to TeamGB’s judokas from the sofa. Judo for all!